The video documenting our Rubicon adventure is finally online! I’ll be honest. From time to time I miss the ability to go grab a bag of fried, cheesy, meaty food from a fast food joint. And, while there are plenty of vegan places that try to fill this niche, have never found one that did it perfectly. Inside this greasy bag is amazing vegan eats. The building is located in an easy location nicely situated next to Balboa Park and seemed to have ample parking (I walked there). It was nice to see a drive up window, proving that vegans should also be allowed the occasional lazy fast food experience. 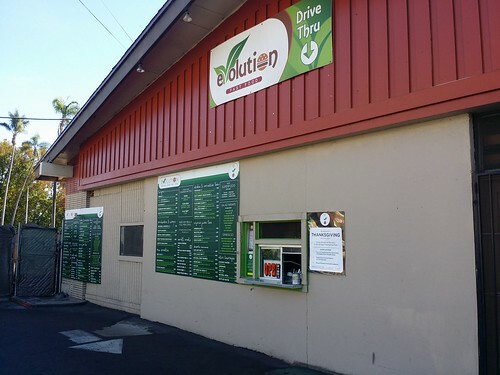 The drive thru window at Evolution. The outdoor seating area, while a bit sparse was nice, and provided a shady spot to eat out of the sun. Service was brisk and friendly. 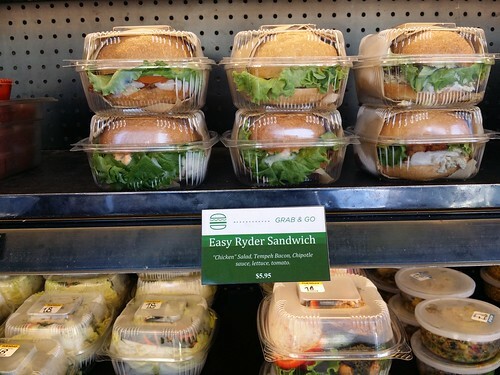 I ordered at the register where they also had a nice selection of grab and go foods, desserts, and drinks. I picked up an organic Blue Sky organic soda to go with my lunch. 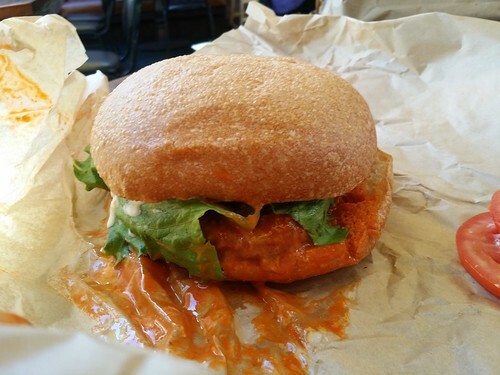 The decision was tough, between the Bacon Cheeseburger and the Buffalo Chicken Sandwich, but at the staff’s recommendation I went with the Buffalo. Lots of grab and go options if you don’t have time to stay. What was most exciting for me? Honestly it was the greasy bag that reminded me of lunch at Ronnie’s (a legendary, non-vegan greasy spoon lunch spot in Auburn MA my family would frequent). 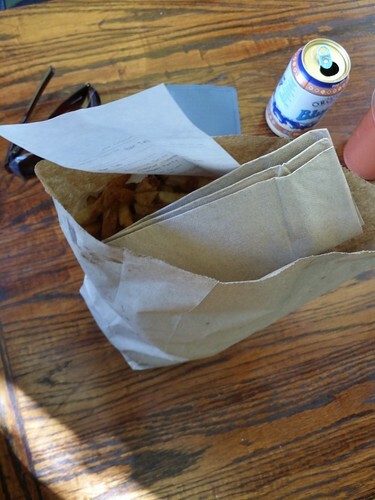 Inside the bag was an awesome white bag of fries, the buffalo chicken sandwich, and ketchup. It was brilliant. Taking the fast food theme even further, a voice squawked over the intercom when my order was ready to be picked up at the counter. I opened the bag, and the strong smell of Buffalo indicated I made the right choice. This sandwich was absolutely amazing. The “chick’n,” while similar to Gardein seemed housemade and had a great texture and flavor. The soft bun was also super good. 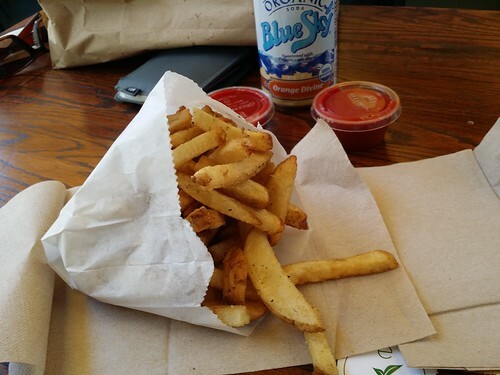 The fries, made fresh from Kennebec potatoes were cooked to perfection and had just the right salt. 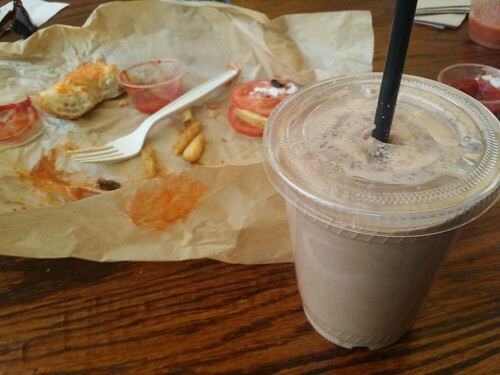 I had to save some room for the chocolate shake I ordered. Made with housemade ice cream, it was not too heavy but perfectly sweet. The best part of this meal was that I didn’t leave in a food coma. While I definitely treated myself to some good ol’ vegan junk food, I still felt good enough to walk the 2 miles back to the hotel. I still have about four days left in San Diego, so I know I will be back to Evolution! One of the last major upgrades I needed to make to my Jeep was a proper lift. I have been happily running the Teraflex 2.5″ “Budget Boost” but we all know those do not offer the benefits of a real lift. So I recently ordered the Evo Long Arm upgrade kit and 4 Evo spec King coilovers for my suspension. The install is cutely referred to as “bolt on” but there is very little bolt on about this. It actually really irritates me that it is branded as such. Evo should consider this a “hybrid solution” that requires minimal cutting and easy welding. You will spend countless hours grinding off stock frame parts and drilling new holes. No instructions are provided (none as in ZERO, NADA) so you will also spend a good amount of time with puzzle pieces and counting hardware parts to see what bolts go where. So I wanted to write this huge post as a way to help those that are about to undertake this install. Hopefully my tips and tricks will save you time and frustration. Grab a cold one, sit down, and read through this post before starting your own kit.